If you desire luxury and a spirited driving experience in the same ultra-pricey car, then Rolls Royce Ghost Series II is meant for you. BMW’s Goodwood-based subsidiary took its sweet time to bring an updated version of Ghost into series production. Rolls Royce consider India as a key market.” In order to meet the customer’s demand for the best in dynamism, modern luxury and industry leading technology, we are proud to launch the new Ghost Series II”, said Sven J Ritter, Rolls Royce Asia-Pacific general manager. The first thing that catches the eye when looking at the Ghost Black Badge is the deep and intense black paint. Far from ordinary, this black finish was created using multiple layers of paint and lacquer that were repeatedly hand polished. But, by far, the most impressive feature of this car is the high-gloss black front grille and “Flying Lady” emblem atop the hood. Rolls-Royces are typically equipped with tons of chrome and this is a rather surprising change. A good one if I may add, as it gives the massive limousine a darker and more assertive appearance. The same high-gloss black was used on the window trim, door handles, exhaust pipes, and basically any details that are usually finished in chrome. The only exterior components that still shine are the wheels. These are also new and unique to the Black Badge by both design and construction, being developed over four years. They are made from carbon fiber and lightweight alloy and feature 22 layers of carbon laid in three axes and folded back on themselves at the outer edges. This gives them 44 layers of strength with further sturdiness added by the the 3D forged, aircraft-grade, aluminum hub which is bonded to the rim using aerospace-strength titanium fasteners. Now, this is the kind of wheel design you’d expect from a manufacturer like McLaren. Needless to say, Rolls-Royce has taken the out-of-the-box route with the Black Badge and did a brilliant job. I’m not a fan of large, bloated sedans, but the Ghost looks outstanding in this all-black suit. Oh, Rolls-Royce says that customers will be able to specify whatever color they wish for the exterior, and this is where I think the folks over at Bespoke are wrong. I get it, Bespoke wants buyers to be able to customize just about anything on their cars, but the Ghost Black Badge is simply too brilliant in black to be offered in any other color. The modeling of the inside is beyond fulfilling, made to stun at every level. The most exquisite range of materials and accents together mold the inside of the cabin, ensuring that the best is gifted for the passengers of this vehicle. The owner can choose between natural grain leather or full grain leather, both of which are equally enticing and lavish in feel. Plus, the lambswool floor mats add to this to captivate all senses of the passengers while seated here. The modern finishes with wood and metallic accents, with leather highlights, are made to immerse the cabin in the most exalting of atmospheres one could ask for. The cashmere-blend or optional leather covered roof lining further rakes up luxury within the car, providing an air of tranquility and beauty for its passengers to bask in through the ride. Options for additional personalization exist for the interior, and these include color schemes for the hand-stitched leather work, and for the steering wheel as well. Bespoke piping and stitching is also available for the seating, and the wooden finish is hand polished for a deep, flawless imprint in every pore of it. Classic blurs such as Paldao, or crossbanded veneer options are available to wrap up the beauty of the wooden finish, and take it to its most exquisite beat yet. The cabin is designed to host the highest of elegance in terms of comfort, and it succeeds on all rounds possible. The fine leather stitching, the modern finishes and the additional leather highlights come together to bring the most refined of atmospheres for the passengers to together bask in for the length of the drive. The spirit of ecstasy rotary controller gives the driver access to the internet, music and to even scribe letters with a mere swipe of a finger. In addition to this, the seats are redesigned with thigh support, meant to ensure the firmest support and positioning for the passengers when seated. The car is fitted with an 8-speed automatic gearbox that is assisted by GPS system. It changes gears automatically according to the road ahead so that you do not feel athing inside it. Equipped with a massive 6.6 liter V12 engine that produces 563 bhp and 780 Nm of torque, its power output is more than the first Ferrari 458 Italia.Though it beats a Ferrari in power output but cannot match it in terms of performance because it weighs around 2.5 tons. Despite its weight, it manages 0-100 kph in 4.9s, and the top speed is limited to 250 kph. There will body roll because of the size of this thing, but you will hardly feel a thing inside because of the way it is designed. Ghost II floats over the tarmac and absorbs most of the hiccups but might struggle in Indian conditions because of the challenging terrain our roads offer.It comes with modern brake assist system that applies full brakes on all four wheels every fraction of a second. The car has electronic traction control and is equipped with ventilated disc brakes.The 6592 cc Petrol – powered variant delivers a fuel economy of 8 kmpl in city and 10 kmpl on highways. You’re more likely to drive the Ghost than its Phantom bigger sister, though it’s still a sizeable machine to pilot around town. It feels authentic enough behind the thin-rimmed wheel, but there’s a bit more chatter through the steering wheel than the Phantom. Likewise, the engine’s heard more often, but the sound of a 6.5-litre twin-turbo V12 isn’t a bad one. The days of Rolls-Royce stating power outputs as ‘ample’ are long gone, but 563bhp more than fits that description. combined with 575lb ft of torque and a slick, but sometimes busy eight-speed automatic, the ghost will reach 62mph in 4.9secs. That should let you escape swiftly from even the most determined traffic- light beggars. The ride is largely excellent, the ghost’s trick air springs claimed to be able to detect which side a passenger sits in the rear and adjust accordingly, but our underinvested roads see the Ghost sometimes struggle to retain its dignified composure. The Ghost comes with stability and traction control, antilock brakes, active front head restraints, front-seat side airbags and side curtain airbags. In simulated panic stops, we recorded an astounding (for its size) 113-foot stop from 60 mph.The Driver Assistance Systems One package includes lane departure warning, automatic high beams and a head-up display. The Driver Assistance Systems Three package further adds a night vision camera (with pedestrian and animal detection warning) and active cruise control (with full stop-and-go capability). Multiple parking cameras are also available. 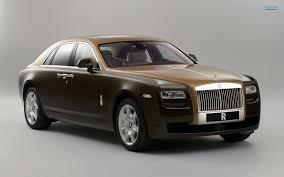 But the extent of attention to detail on the RR Ghost doesn’t stop just at visual treats and driving pleasure. There’s a whole lot of ergonomics blended in as well. For example, the suspension rides on a blanket of air (to put it in rather layman terms) and the car balances itself out when going hard through a corner; so there’s no body roll and subsequently none of the occupants will feel like throwing up! Alternatively the car can be lowered for that little bit of extra-easy ingress and egress – especially for the ladies wearing intricate party ensembles. The suicide doors at the back form a natural corridor to mark the premises of the car.There are cameras all round which also give you a bird’s eye view of the car making it easier to park. We could go on and on but that list is so endless that maybe it’s just better to take a look at the Rolls Royce Ghost’s brochure after all – mind you, it may take days before you get to the end of the options list! So there you have it – the Ghost is a machine that is as good to drive as it is to catch attention; just like any other Rolls Royce. And if you happen to be fortunate enough to get a ride in one of these, do pay special notice to the umbrellas neatly tucked away in all four doors – these guys have thought of everything, haven’t they!